In Determined to Develops’s (D2D) rural catchment area, most people retrieve their water in the traditional Malawian way, by carrying heavy, cumbersome buckets balanced on the head from long distances. Women and children spend hours each day collecting water from often unsafe sources for bathing, cooking, drinking and cleaning. Streams and lakes are easily contaminated and many hand pumps are broken, leaving no choice but to go back to unsafe water sources. It is estimated that half of the rural population in Malawi have to travel over 30 minutes to obtain their drinking water. As the Malawian saying ‘Madzi ndi moyo’ goes: Water is life! D2D is heavily engaged in its signature project of constructing Wasambo High School and gaining access to clean, running water has been high on the agenda. It is with excitement that we report on the working solar pump water system which has recently been installed at the school site. 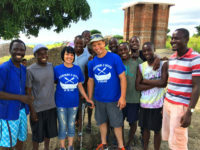 Larry & Mindy Moore of Memmers Water Tech (based in Ohio, USA), embarked on their second trip to Malawi to assist D2D with water based projects. Experts in installing and maintaining water pumps, Larry & Mindy arrived armed with a wealth of necessary hardware, which is difficult to source in Malawi. Previously at the school site there was no running water meaning workers and locals would typically walk over a mile to fetch buckets of water which often weigh around 32lbs. Now, Wasambo High School has access to solar pumps which draw clean water from 2 different bore holes to 4 tanks capable of holding 20,000 litres. The tanks are connected to water pipes spanning the whole campus, bringing clean water to different locations across the high school, cutting the time people walk for water in half. 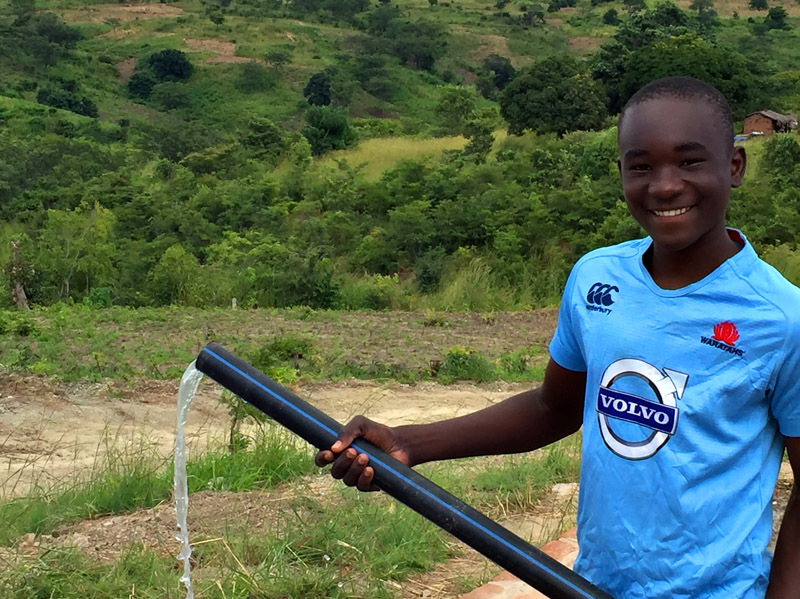 Under instruction from Larry, a team of Malawians assisted in the completion of this project by digging tunnels for connecting pipes, transporting materials, welding a mount for solar panels to be installed onto and working against a time crunch. 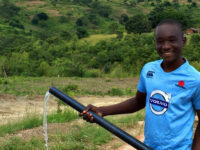 In just 4 working days, Larry and the team succeeded in not only installing an extensive water system at the Wasambo High School site, they also refurbished a community hand pump and installed a second solar pump for use at D2D headquarters, home to 50 residential sponsored youth. For Larry & Mindy, the most rewarding part was seeing the reactions of those witnessing water for the first time at Wasambo High School. As the dry season approaches, hand dug and open wells dry up, meaning less access to water for construction workers and community members alike. A longer search for water means less productivity and more manual labor. The new water system means all of these hindrances are quashed. It is a welcome development. Even at D2D headquarters, with a functioning electric water pump providing chlorinated lake water to the campus, challenges still prevailed. Power outages and faulty equipment mean the pump is regularly out of action and sand often infiltrates the water. The new solar pump Is reliable, environmentally friendly and cost effective. 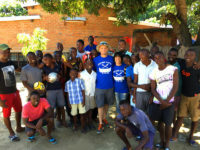 D2D extends their heartfelt thanks to Larry and Mindy Moore for taking the time to come to Chilumba and assist on a project which will have an impact for years to come. Many take it for granted to turn on the tap in the home and have access to clean water. We do it every day because we use water every day. For a large portion of the world, something as simple as getting a drink of clean water is a very different experience. D2D is proud to have supporters who understand that too, and are with us in the mission to excel sustainable, human advancement. A simple thank-you doesn’t seem enough for welcoming us to Maji-Zuwa with truly a warm heart. Our time with you was rewarding and uplifting, one we won’t soon forget. The words “you are an inspiration to us” were spoken but lost in translation as we reflected on how you have touched and changed our lives. Dieter F. Uchtdorf once said, “It is your reaction to adversity, not the adversity itself, that determines how your life’s story will develop.” Obstacles do not block the path, they are the path. Strength doesn’t come from what you can do. It comes from overcoming the things you once thought you couldn’t. Your character defines you and your smiles are contagious! Thank-you, from the bottom of our heart, for teaching us all of this and so much more. We miss you and think of you often.